Aim: The plant derivative, the gum’s exudates are of great interest among polysaccharides. Nowadays, it is of crucial importance to study the structural peculiarities and the conditioned biological activity of the Gummi Armenicae of native origin as an alternative version of the Gummi Arabicae. Materials and methods: As a material for research served the gum procured from Apricot trees (Armenian Vulgaris Lam. ), cultivated in different regions of Armenia annually in spring during juice motion period in 2010-2014 years. The quantity of polysaccharides in gum was determined by the method of gravimetric balance after drying. The quantitative ratio of monosaccharide in the examined polysaccharide complex was detected by the method of MRI. Results: By the methods of spectral analysis (PMR 1H and NMR 13C) the structure of Apricot gums polysaccharide fraction was detected. 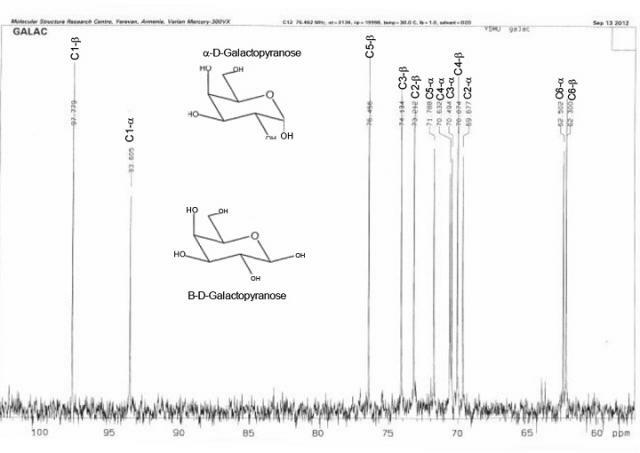 From the analysis of PMR 1H and NMR 13C spectra it is obvious that polysaccharide complex fraction is composed from the rest of α- L-arabionopyranose, β -L-arabionopyranose, α- D-galactopyranose, β -D-galactopyranose, α -D-glucopyranose, β -D-glucopyranose. Low molecular compounds in nonpolar fraction of apricot gum were determined by GC-MS method. The results show that in Rt1=22.5, Rt2=26.3, Rt3=31.4. Simple phenols were registered – peaks of catechols` hydroquinones, pyrogallols, amounts of which are respectively 7.58%, 4.27%, 5.69%. 13C NMR analysis of polysaccharide complex - β-Larabinopyranoses and α-L- arabinopyranoses. Babken CN, Suren M, Naira S, Yelena M. The Phythochemical Research of Armenian Apricot Gums (Gummi armeniacae). Pharmacognosy Journal. 2018;10(3):476-479.